Village communities in Southeast Asia get nurturing help from within and with the assistance of international volunteers via short breaks (a week or so) or longer stints for service (month or more) from Journeys Within Our Community. By working at the local level and focusing on community-determined needs like clean water, education, health, shelter, and emergency relief, JWOC starts projects small that then grow with outside support, gaining momentum and changing lives. 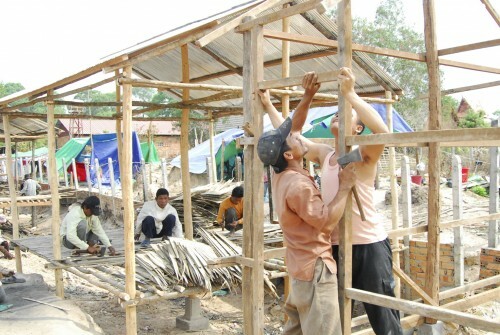 Work projects are in Cambodia, Laos, and Myanmar (Burma). Over the last five years of work, there are now over 70 students in those three nations going to university thanks to the JWOC Scholarship Program. There are three JWOC Free Schools in Cambodia and Laos that operate six days a week. There are over 300 wells offering clean water to villagers in the Siem Reap area and in Laos local children now have the resources they need thanks to the JWOC Village School Sponsorship. JWOC has also given out over 200 micro loans to families living below the poverty line. Volunteers work with specialized programs based on the skills you bring (and your skills need be no more elaborate than a willingness to work…but if you have teaching experience or carpentry skills or medical training, let them know when you sign up), and a nice element of the management of this grassroots organization is that long-term projects are re-evaluated regularly, and monthly priorities are established in response to the shifting terrain of change. This responsiveness is hugely important and surprisingly rare among NGOs. JWOC was founded under the ideal of See a Problem, Solve a Problem…words to live by.